Preheat oven to 425°. Peel and cube the sweet potatoes and Yukon Gold potatoes. Scrub the new potatoes and cut into cubes. Place the potatoes in a large saucepan. Add enough lightly salted water to cover the potatoes. Bring to a boil and cook for 3 minutes. Drain. Spread onto a large nonstick baking sheet in a single layer. Drizzle with olive oil and sprinkle with tarragon, salt and pepper. 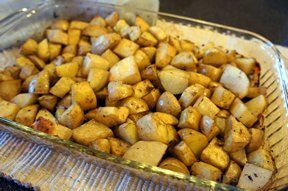 Roast potatoes until browned and crisp, about 25 minutes. Serve immediately.